Particulates, also referred to as particulate matter (PM), aerosols, or fine particles, are tiny particles of solid or liquid suspended in a gas. They range in size from less than 10 nanometers to more than 100 micrometers in diameter. The field of aerosol science and technology has grown in response to the need to understand and control aerosols in the atmosphere. Some particulates occur naturally, originating from volcanoes, dust storms, forest and grassland fires, living vegetation, and sea spray. Human activities, such as the burning of fossil fuels, also generate aerosols. Averaged over the globe, anthropogenic aerosols (those produced by human activities) currently account for about 10 percent of the total amount of aerosols in the atmosphere. The effects of inhaling particulate matter have been widely studied. Whereas relatively large particles are filtered out in the nose and throat, particles smaller than about 10 micrometers settle in the bronchial cavities and lungs, leading to health problems such as asthma, lung cancer, cardiovascular issues, and premature death. It also appears that particles smaller than 100 nanometers may pass through cell membranes, and some of them may migrate into the brain. Steps are now being taken to control the amount of anthropogenic aerosols entering the atmosphere. The notation PM10 is used to describe particles of 10 micrometers or less, and PM2.5 represents particles less than 2.5 micrometers in aerodynamic diameter; other numeric values may also be used. This range of sizes represents scales from a gathering of a few molecules to the size where the particles no longer can be carried by the gas. 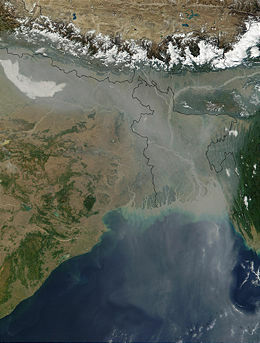 Aerosol pollution over Northern India and Bangladesh - Photo: NASA. There are both natural and human sources of atmospheric particulates. The biggest natural sources are dust, volcanoes, and forest fires. Sea spray is also a large source of particles, though most of these fall back to the ocean close to where they were emitted. The biggest human sources of particles are combustion sources, mainly the burning of fuels in internal combustion engines in automobiles and power plants, and wind-blown dust from construction sites and other land areas where the water or vegetation has been removed. Some of these particles are emitted directly to the atmosphere (primary emissions) and some are emitted as gases and form particles in the atmosphere (secondary emissions). In Europe and the United States, particulate emissions from vehicles are expected to decline over the next decade. For example, by 2005, the European Union will introduce more stringent standards for particulate emissions from light-duty vehicles of 0.025 grams per kilometer [0.04 grams per mile]. The state of California is implementing an even more restrictive standard in 2004, allowing only 0.006 grams per kilometer [0.01 grams per mile] of particulate emissions. Even if the California standard were introduced worldwide, says Jacobson, diesel cars may still warm the climate more than gasoline cars over 13 to 54 years. New particle traps being introduced by some European automobile manufacturers in their diesel cars appear to reduce black carbon emissions to 0.003 grams per kilometer [0.005 grams per mile], even below the California standard. BlueTec is one technology developed to reduce particulate emissions from diesel engines in order to meet stringent Californian standards. The composition of aerosol particles depends on their source. Wind-blown mineral dust tends to be made of mineral oxides and other material blown from the Earth's crust. This aerosol is light-absorbing. Sea salt is considered the second largest contributor in the global aerosol budget, and consists mainly of sodium chloride originating from sea spray. Other constituents of atmospheric sea salt reflect the composition of sea water, and thus include magnesium, sulfate, calcium, potassium, and other ions. In addition, sea-spray aerosols may contains organic compounds, which influence their chemistry. Sea salt does not absorb light. Secondary particles derive from the oxidation of primary gases such as sulfur and nitrogen oxides into sulfuric acid (liquid) and nitric acid (gaseous). The precursors for these aerosols, i.e., the gases from which they originate, may have an anthropogenic origin (from fossil fuel combustion) and a natural biogenic origin. 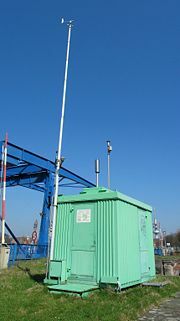 In the presence of ammonia, secondary aerosols often take the form of ammonium salts, such as ammonium sulfate and ammonium nitrate (both can be dry or in aqueous solution). In the absence of ammonia, secondary compounds take an acidic form, as sulfuric acid (liquid aerosol droplets) and nitric acid (atmospheric gas). Secondary sulfate and nitrate aerosols are strong [scattering|light-scatterers]]. This is mainly because the presence of sulphate and nitrate causes the aerosols to increase to a size that scatters light effectively. Organic matter (OM) can be either primary or secondary, the latter part deriving from the oxidation of VOCs; organic material in the atmosphere may either be biogenic or anthropogenic. Organic matter influences the atmospheric radiation field by both scattering and absorption of light. Another important aerosol type is constituted of elemental carbon (EC, also known as black carbon, BC); this aerosol type includes strong light-absorbing material and is thought to yield large positive radiative forcing. Organic matter and elemental carbon together constitute the carbonaceous fraction of aerosols. In general, the smaller and lighter a particle is, the longer it will stay in the air. Larger particles (greater than 10 micrometers in diameter) tend to settle to the ground by gravity in a matter of hours whereas the smallest particles (less than 1 micrometer) can stay in the atmosphere for weeks and are mostly removed by precipitation. Aerosols, natural and anthropogenic, can affect the climate by changing the way radiation is transmitted through the atmosphere. Direct observations of the effects of aerosols are quite limited, so any attempt to estimate their global effect necessarily involves the use of computer models. The Intergovernmental Panel on Climate Change, IPCC, says: "While the radiative forcing due to greenhouse gases may be determined to a reasonably high degree of accuracy… the uncertainties relating to aerosol radiative forcings remain large, and rely to a large extent on the estimates from global modelling studies that are difficult to verify at the present time." A graphic showing the contributions (at 2000, relative to pre-industrial) and uncertainties of various forcings is available. Sulfate aerosol has two main effects, direct and indirect. The direct effect, via albedo, is to cool the planet: The IPCC's best estimate of the radiative forcing is -0.4 watts per square meter with a range of -0.2 to -0.8 W/m², but there are substantial uncertainties. The effect varies strongly geographically, with most cooling believed to be at and downwind of major industrial centers. Modern climate models attempting to deal with the attribution of recent climate change need to include sulfate forcing, which appears to account (at least partly) for the slight drop in global temperature in the middle of the twentieth century. The indirect effect (via the aerosol acting as cloud condensation nuclei, CCN, and thereby modifying the cloud properties) is more uncertain but is believed to have a cooling effect. Black carbon (BC), or Carbon Black, or Elemental Carbon (EC), often called soot, is composed of pure carbon clusters, skeleton balls, and buckyballs, and is one of the most important absorbing aerosol species in the atmosphere. It should be distinguished from Organic Carbon (OC): Clustered or aggregated organic molecules on their own or permeating an EC buckyball. BC from fossil fuels is estimated by the IPCC in the Fourth Assessment Report of the IPCC, TAR, to contribute a global mean radiative forcing of +0.2 W/m² (was +0.1 W/m² in the Second Assessment Report of the IPCC, SAR), with a range +0.1 to +0.4 W/m². All aerosols both absorb and scatter solar and terrestrial radiation. If a substance absorbs a significant amount of radiation, as well as scattering, we call it absorbing. This is quantified in the Single Scattering Albedo (SSA), the ratio of scattering alone to scattering plus absorption (extinction) of radiation by a particle. The SSA tends to unity if scattering dominates, with relatively little absorption, and decreases as absorption increases, becoming zero for infinite absorption. For example, sea-salt aerosol has an SSA of 1, as a sea-salt particle only scatters, whereas soot has an SSA of 0.23, showing that it is a major atmospheric aerosol absorber. The effects of inhaling particulate matter have been widely studied in humans and animals and include asthma, lung cancer, cardiovascular issues, and premature death. The size of the particle is a main determinant of where in the respiratory tract the particle will come to rest when inhaled. Larger particles are generally filtered in the nose and throat and do not cause problems, but particulate matter smaller than about 10 micrometers, referred to as PM10, can settle in the bronchi and lungs and cause health problems. The 10 micrometer size does not represent a strict boundary between respirable and non-respirable particles, but has been agreed upon for monitoring of airborne particulate matter by most regulatory agencies. Similarly, particles smaller than 2.5 micrometers, PM2.5, tend to penetrate into the gas-exchange regions of the lung, and very small particles (less than 100 nanometers) may pass through the lungs to affect other organs. In particular, a study published in the Journal of the American Medical Association indicates that PM2.5 leads to high plaque deposits in arteries, causing vascular inflammation and atherosclerosis —a hardening of the arteries that reduces elasticity, which can lead to heart attacks and other cardiovascular problems. Researchers suggest that even short-term exposure at elevated concentrations could significantly contribute to heart disease. There is also evidence that particles smaller than 100 nanometers can pass through cell membranes. For example, particles may migrate into the brain. It has been suggested that particulate matter can cause similar brain damage to that found in Alzheimer patients. Particles emitted from modern diesel engines (commonly referred to as Diesel Particulate Matter, or DPM) are typically in the size range of 100 nanometers (0.1 micrometers). In addition, these soot particles also carry carcinogenic components such as benzopyrenes adsorbed on their surface. It is becoming increasingly clear that the legislative limits for engines, which are in terms of emitted mass, are not a proper measure of the health hazard. One particle of 10 µm diameter has approximately the same mass as 1 million particles of 100 nm diameter, but it is clearly much less hazardous, as it probably never enters the human body—and if it does, it is quickly removed. Proposals for new regulations exist in some countries, with suggestions to limit the particle surface area or the particle number. The large number of deaths and other health problems associated with particulate pollution was first demonstrated in the early 1970s and has been reproduced many times since. 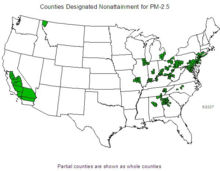 PM pollution is estimated to cause 22,000–52,000 deaths per year in the United States (from 2000). and 200,000 deaths per year in Europe). Due to the health effects of particulate matter, maximum standards have been set by various governments. Many urban areas in the U.S. and Europe still exceed the particulate standards, though urban air on these continents has become cleaner, on average, with respect to particulates over the last quarter of the twentieth century. 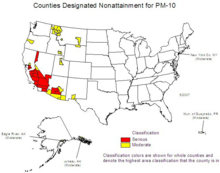 The United States Environmental Protection Agency (EPA) sets standards for PM10 and PM2.5 concentrations in urban air. (See National Ambient Air Quality Standards.) EPA regulates primary particulate emissions and precursors to secondary emissions (NOx, sulfur, and ammonia). The most concentrated particulate matter pollution tends to be in densely populated metropolitan areas in developing countries. The primary cause is the burning of fossil fuels by transportation and industrial sources. ↑ Despite lower carbon dioxide emissions, diesel cars may promote more global warming than gasoline cars. Stanford News Service. Retrieved October 12, 2007. ↑ Soil dust. Intergovernmental Panel on Climate Change. Retrieved October 12, 2007. ↑ Sea salt. Intergovernmental Panel on Climate Change. Retrieved October 12, 2007. ↑ Sulphates. Intergovernmental Panel on Climate Change. Retrieved October 12, 2007. ↑ Carbonaceous aerosols (organic and black carbon). Intergovernmental Panel on Climate Change. Retrieved October 12, 2007. ↑ Discussion of Uncertainties. Intergovernmental Panel on Climate Change. Retrieved October 12, 2007. 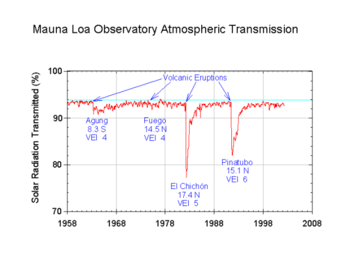 ↑ The global mean radiative forcing of the climate system for the year 2000, relative to 1750. Intergovernmental Panel on Climate Change. Retrieved October 12, 2007. ↑ Sulphate Aerosol. Intergovernmental Panel on Climate Change. Retrieved October 12, 2007. ↑ Pope, Arden C. et al. 2002. "Cancer, Cardiopulmonary Mortality, and Long-term Exposure to Fine Particulate Air Pollution." J. Amer. Med. Assoc. 287:1132–1141. ↑ Lave, Lester B., Eugene P. Seskin. 1973. "An Analysis of the Association between U.S. Mortality and Air Pollution." J. Amer. Statistical Association 68:342. ↑ Mokdad, Ali H., et al. 2004. "Actual Causes of Death in the United States, 2000." J. Amer. Med. Assoc. 291:10:1238. ↑ Air Pollution. Site Resources, Worldbank.org. Retrieved October 12, 2007. Aerosols, their Direct and Indirect Effects. The Intergovernmental Panel on Climate Change. Retrieved October 12, 2007. Charlton, Jeff. Pandemic Planning: A Review of Respirator and Mask Protection Levels. Continuity Central. Retrieved October 12, 2007. Hardin, Mary and Ralph Kahn. Aerosols and Climate Change. EO Library, NASA. Retrieved October 12, 2007. Preining, Othmar and E. James Davis (eds.). History of Aerosol Science. Österreichische Akademie der Wissenschaften. American Association for Aerosol Research. Watch and read "Dirty Little Secrets". 2006 Australian science documentary on health effects of fine particle pollution from vehicle exhausts. This page was last modified on 16 January 2019, at 17:56.